What is the best hangboard? Hangboards are also known as finger boards, in which it involves engaging your arm and shoulders, a part of the training for climbers. They’re not on the pricey side and they’re available in different shapes and sizes, depending on your needs. For beginner climbers, we recommend getting the type of hangboard that is incredibly easy to train on, comfortable, and with even spaces in between the board. Hangboards help build the strength of your fingers as you train yourself to climb. For every climber, whether you’re a beginner climber or an advanced climber, the right hangboard and sufficient training has proven to provide effective forearm strength training. Wood: This type of material has less friction so it has an increased difficulty, but it is skin-friendly. Try not to apply chalk because it may get greasier when the chalk covers the wood. The only con about wood is that it has limited shapes and wooden hangboards that don’t always have different kinds of holds when you compare it to Polyester Resin boards. It is lighter and it looks nice hanging on the wall. It is usually has great pockets and edges but the slopers are often slippery. Polyester Resin: this has been the material of choice of manufacturers for the past few years, and only recently has had polyurethane added to the mix to increase durability and reduce weight. It’s a great material because it can be made into almost any shape imaginable and there are a lot more hold options compared to wooden hangboards. The only disadvantage is that it can be harder on the skin. Polyester Resin is not a heat conductor so it will not feel warm when you leave it in hot places for a period of time. Polyurethane: This type of material is lighter in weight and is less likely to chip off. It has a wide range of holds. However, the disadvantage of this material is that it has more texture when you compare it to the wooden material. These are small openings throughout the body of the hangboard that are used to train your fingers, which is a great training technique for strength. People usually put less emphasis on the pockets because they can easily do any of these on a flat edge. Also, some climbers think that it’s better to do the finger workouts on the flat edge because it provides more surface area and is better for holding. Engage the both of your arms and shoulders but do not lock the both of them at once. It is best to have a partner to work with to make your experience less tedious and more fun. Get a stopwatch to time your hang time while you train, as you can push yourself to beat your old time. Do not train frequently in a short period of time. It takes a while for your body to adapt. Do it with rest days in between. Always give yourself a break and have a decent rest for your muscles and your body to recuperate. 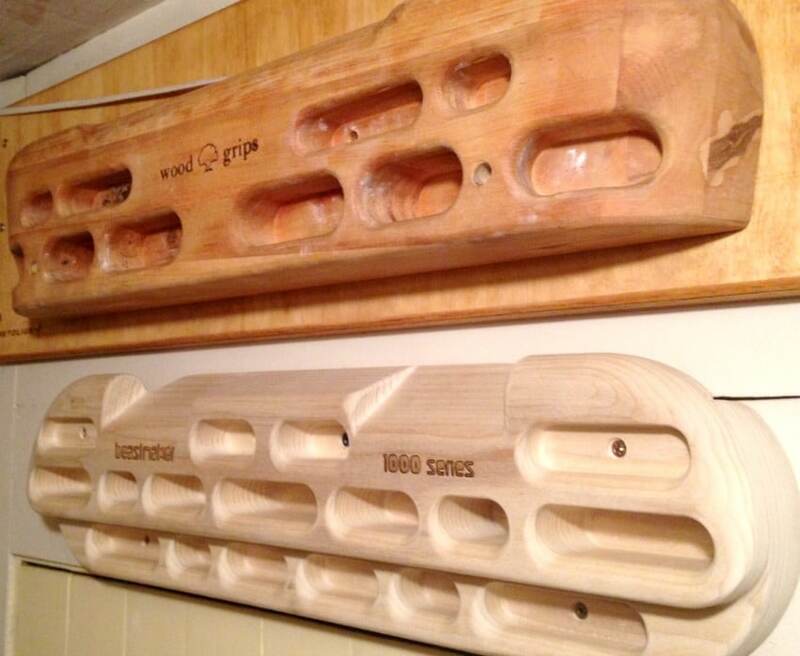 Below are some of the best hangboards in our opinion which we think would be great for climbers to bring to their training sessions. Features: Ergonomically curved with 4 central edges from shallow to deep. CAD/CAM designed master and huge indexed hold. Skin-friendly texture with 11 pockets to choose from. Description: The Metolius Contact Training Board comes deluxe features such as a variety of holds and is CNC-milled for perfect symmetry. It has an excellent progression of holds. It is ergonomically curved to reduce the pressure on the joint and to reduce the likeliness of injury. Its indexed hold selection includes eleven pockets to choose from along with four central edges from shallow to deep top mounted pull-up jugs. It has rounder slopers, all made of fine grained texture. As it is made of good quality and sustainable materials, it is skin-friendly. It also comes with comprehensive instructions, training guide and mounting hardware for installation. Features: Ergonomic design with 2 Jugs, 35 Degrees Slopers and 20 Degree Sloppers. Includes 1 Deep 4 Finger Pocket, 2 Deep 4 Finger Pockets, and 2 Deep 3 Finger Pockets. Holds are radiused and made of wood. Description: The Beastmaker 1000 hangboard has been designed ergonomically for the beginner climbers who are looking to train and make a progress in a short period of time. It has plenty of tricky grips and a lot of good edges and slopers to train the strength of your fingers. It’s a fantastic fingerboard if you’re new to hangboard training and want to make the most of it. The Beastmaker 1000 series allows various ways of holds and gives climbers more depths. Features: 45 Degree Slopers, 35 Degree Slopers and 20 Degree Slopers. Comes with medium 3 finger socket, smaller 3 finger socket and mouth jug. Also has big, little and incut rungs back 2 pockets big, little and sloping 2 finger pockets. Description: The Beastmaker 2000 is more suitable for intermediate or advanced climbers, and is definitely not for beginners as it is designed to test the limits of your finger strength and help train you towards achieving your high grade goals. It consists of many different holds which will let you learn how to target your weaknesses and train yourself to get stronger in all of the different types of grip. It also features 2 back pockets, 45 degree slopes and 1 pad monos. The Beastmaker 2000 is also made in England from sustainable resources that are eco-friendly. In comparison with Beast 1000, it is a lot harder but they have wonderful pockets. It has very fine wood texture which gives the climber a very smooth feel, and they’re easy to install. You can do a pull-up on the 45 degree slopers after a few training sessions and you’ll find that a lot of technique is involved when you get as much of your body behind the board as possible. It’s the most challenging and well-designed board that is really kind on the skin. It compromises of mouth jug, big little and incut rungs, back 2 pockets, medium and smaller 3 finger sockets. Description: It is based on the successful training routines of the authors of “The Rock Climber’s Training Manual: A Guide to Continuous Improvement”, Mark and Mike Anderson. It allows you to fine tune your position to match your body and the computer engineered design yields allow for perfect symmetrical holds. The design of the Trango Rock Prodigy hangboard is based on years of experimentation and refinement. It is the perfect climbing tool to help climbers train and progress to the next level of climbing while training the strength of their hands. It has a signature two-piece design which allows more flexibility for customers of different sizes to be able to have a better grip at their own comfortable level. With its ergonomic widths, it helps relief strain on the climber’s shoulder, elbow, wrist and finger joints. It also helps reduce the chances of being injured. It alleviates the space between the hangboard where the grips may be too close for two-arm hangs. It can be adjusted according to the climber’s physique. Climbers will find its variable-depth edge rails a perfect edge for their fingers and ability. Climbers can turn quickly to the same location on the Variable Depth Edge as there is a position index bumps located at the back of the Variable Depth Edge Rails. Climbers will then find it easy to progress to edges that are more difficult with their hands shifted outward. The texture is thick which allows tacky grip and at the same time, it minimizes skin irritation. You will need a drill, level, tape measure, marker or pencil, mounting board, and wood screws for installation. Features: Includes mounting hardware, various types of holds including jugs, big sloper, edges and pockets. Comes with instructions and training guide. Description: This training Metolius Wood Grips Compact Training Board fits and easily matches any home décor with its wooden material. You can mount it on the door or the wall, giving you the versatility to find the right spot to set up your board. The quality is excellent and has a good feel on the skin, with the added benefit of the wood consisting of sustainable materials. The wood is dark and has an excellent grain for friction. It comes with eight deep and aggressive screws and pre-drilled holes to place them in. It is a nice compact training board that has a plastic grip which gives your fingers nice touch. Due to the fact that there are no sharp or splinter edges, there is a fair amount of holding options. The deeper and shallower pockets that come with it allow you to work on your grip strength in different ways. There are also two bigger pockets at the top that are great for doing pull ups and just hanging. Features: Arranged along broad arc that tapers outward and downward. Includes tapers from top to bottom in both dimensions and CAD/CAM designed. Description: The Metolius Simulator 3D Training Board is the best-selling training board. It is designed with CAD/CAM for great symmetry. It is made of fine texture that provides different kinds of holds. It also comes with comprehensive instructions and training guide to help with the installation. The way that the board is designed with a curve is what makes it ergonomic for your body mechanics if you were to compare it to the previous model. After using this fingerboard to train yourself for days, you’ll find that it helps increase finger strength. It has been fine-tuned to near perfection and is made of polyester resin that is CNC-milled. It holds on the Simulator 3D which is sturdy, grippy and rugged. It comes with eight screws and would need a drill, level, mounting board and tap measurer for installation. It has been proven that after a few weeks of regular use, many of the climbers found that there is an improvement in their forearm strength and endurance. Features: Slot mechanism, foam padding and climbing hold hex tool with holder included. Assembles with 6 burly bolts and comes in light stain. Description: The Blank Slate Climbing Trainer has great quality components with foam padding and felt to prevent door trim damage. Its slot mechanism allows for different board height and trims. It also comes with foam padding. It requires clearance of 9.5 inches between the ceiling and the trim. You can easily hang it on the wall without much drilling needed. You are advised to attach the blank slate with countersunk bolts to J-Bars. It is a fantastic tool for all climbers as it includes two heavy-duty black rubber bands that can hold your smartphone, watch or a mini radio while you train. The Blank Slate is most suitable for static movements, not dynamic movements. Pull ups can be done and it supports up to 300lbs. The force down on the board creates a torque against the wall which is known as the cantilever effect. You can mount it on the wall or the doorway. It is high-quality stained with a treated birch wood board. It also consists of 17 holes with standard t-nuts for holds and fingerboards. You can also find powder-coated high-grade steel components included. It fits any door frame however it can be slightly heavy and bulky, and climbers may have to get used to the flex. Its crossbar measures at 42” and the board measures at 30” x 19”. Features: Tapers from top to bottom in both dimensions, broad arc that tapers outward and downward. CNC milled master and comes with instructions. Description: This Metolius Project Training Board is an affordable option, and it is CNC-milled for perfect symmetry. The slopes on the board are rounder and features a large radius but slopes have been incorporated onto the training board to the edges. These type of boards provide a different kind of grip training and they are not versatile. The training board is more suitable for stronger climbers, not for beginners. It has a very fine texture and is skin-friendly. It includes instructions, a training guide and all mounting hardware. The fact that it allows various types of holds and is made of natural arc is perfect to be hung on the bedroom door or the wall. You can use it to train your forearm and it can help to build the strength for your fingers. The Metolius Training Board also comes with one-year warranty. It is compact and measures at 24.5 x 6inches, so it will easily fit just any home or apartment. It comes with jugs so you can always hang it and bust out pulls ups whenever you like. The middle sloper on the board is a big sloper that is great for offset pull ups. The number of crimps across the board is great for doing sequences across the 2-finger, 3-finger and 4-finger crimps. There is a gentle curvature to this training board which is great as you’re working through training sequences. It’s a heavier training board but it is not hollow backed and there is no remounting required, unlike other climbing holds. It’s very easy to install, with only eight screws in total. A hangboard definitely helps improve one’s finger and forearm strength. We hope that after reading this review, it may be able to help you narrow your options and decide between which products to purchase and which materials to choose from. These are a great investment to have for those who are interested in becoming avid climbers, as it will provide them all of the strength training that they need from the comfort of their own home. Have you got any questions about this article? Have any product suggestions we may have overlooked? Comment below!